This new (2012) four bedroom de-luxe villa is 500 meters from Hisaronu town centre, 5 mins walk to Dolmus buses and taxi rank. 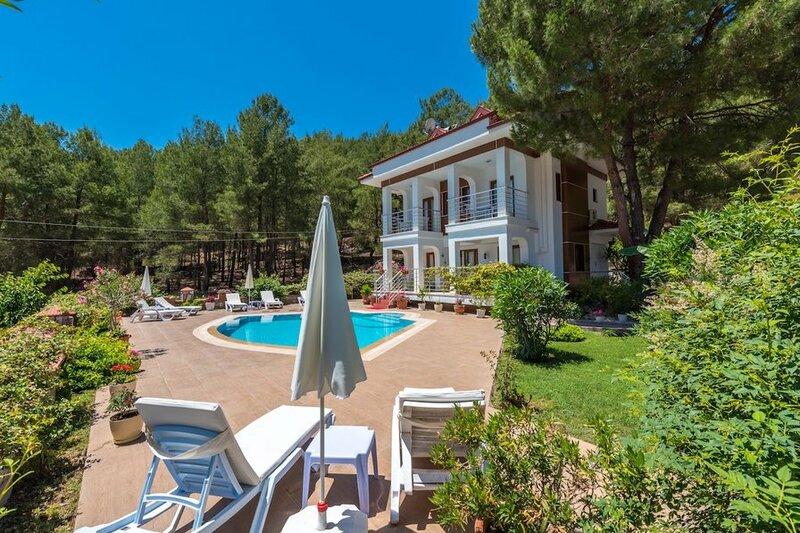 Hisarou is very popular and so close to Oludeniz, the villa is in a secluded pine Forrest area located so close to Hisaronu a car is not a requirement, the villa has great views from the poolside and all four bedrooms have their own terrace. its easy walking to town centre where there is shops, restaurants, bars, night clubs. The villa is in a an area at the edge of a pine Forrest. Villa Lorraine ground floor is open plan with all electrical appliances, washing machine, dishwasher, microwave, cooker, toaster, kettle, iron, ironing board etc dinning for 8, inside and on the patio and lounge area, TV/DVD/CD Player and WIFI. There is also a separate toilet/washroom on this floor. The second floor has the master bedroom with dressing room and safe, and has an en suite, it also has a king size bed with orthopeadic mattress and bedside cabinets and dresser, it has patio doors leading onto its own balcony.The second bedroom has en-suite shower/toilet, king size bed with Othopeadic mattress, bedside cabinets, large wardrobe and dresser and patio doors open onto its own balcony. Third floor has two bedrooms, bedroom three has two single beds with Orthopeadic mattresses built in wardrobes, chest of drawers and bedside cabinet. bedroom four has two single beds with Orthopeadic mattresses, bedside cabinet, wardrobe and dresser. These two bedrooms share a shower room, both open onto a balcony. All four bedrooms have blinds, shears, AC, rugs, lamps, plus wall lights. The two main bedrooms have hair dryers. All bedding and towels supplied. Pool area, good size pool with roman steps and large patio area, with enough sun beds/cusions for eight people,facing sun all day. Table and chairs for dinning outside plus bar-b-cue. Floodlit gardens including bug zappers. Off road car parking for two cars. There are within walking distance several supermarkets. THE OWNERS OF VILLA LORRAINE WILL NOT BE RESPONSIBLE FOR ANY ACCIDENT, OR LOSS AT THE VILLA OF PERSONAL EFFECTS, A SAFE IS PROVIDED FOR YOUR USE. There will be a front door and back door key available. If this property is researched on Google maps the address is Likya Caddesi road name, (road between Liberty Hotel and Pine Valley) since there are now a number of Villas with no number system ours is Villa Lorraine and is the group of four villas on the Google Arial photo, Of the group of four ours is the one closest to the pine valley Hotel and closest to the Pine forest. Views of mountain range and Hisaronu.